In February 1986 Mark Beresford and Dave Whelan met with their old Scout Master Mr R G Walker to discuss starting a running club in the locality. It was decided to have a meeting on 12th February at Mr Walker’s home. There were 12 people present and ‘Caergybi Striders’ was formed with Raymond (Digger) Walker as Chairman and Margaret Beresford as Secretary. During this meeting it was decided to join the AAA and a constitution was drafted. Annual adult fees were set at £3. On 27th February 1986 a general meeting was held in the Town Hall with 9 committee members and 33 others present. The Club name ws changed to ‘CYBI STRIDERS’ and Maarssen, Mill Road would be the headquarters, by March there were social events, races, club vests and membership of the AAA all being organised. 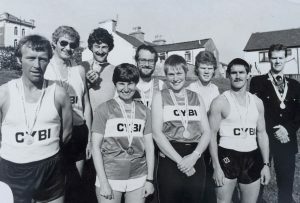 On 1st March 1987 (St David’s Day) the first Cybi Striders race (over 10 miles) was organised, also in 1987 11 club members were accepted in the London Marathon and Junior members were admitted. The first Annual General Meeting was held on 23rd March in Holyhead Town Hall. This was an exciting and busy era in the young club’s history. Keith Williams of Holyhead was a keen and popular committee member, unfortunately Keith died whilst running the Snowdonia marathon in October 1987 leaving a young family. The club’s10 mile road race was re-named ‘The Keith Williams 10 mile road race – Holyhead” in his memory. By 1989 there were 53 adults and 65 juniors in the Club. During these early years many races were organised including fundraising events for local charities. In 1996 it was decided to change the club colours from grey with a white hoop to the blue and white that we still have today. From 1997 onwards interest in the Club waned and some races had to be cancelled, only 11 members attended the 1998 AGM. Under threat of closing the Club down the 2007 AGM generated more interest and the ending of the Club was considered and rejected. During this meeting Margaret Beresford and Trevor Selby stood down after 21 and 18 years service respectively, their work over the years is much appreciated. The new Committee, under the guidance of John Lyon, energetically and enthusiastically set out to attract new and old members and slowly numbers grew until now the membership averages out each year at 50. We have a FACEBOOK page and a new website at cybistriders.co.uk The new logo features a map of both the Isle of Anglesey and Holy Island to illustrate the growth of the Club throughout the County and not in Holyhead only.